Notice the lack of confirmation of current password. 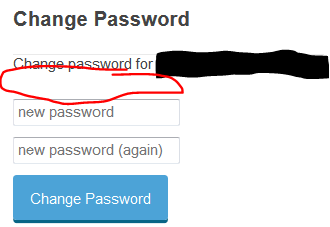 I love that I can stay logged in to Stack Exchange sites permanently, but it worries me that someone could change my password without knowing my current password. The password to your Stack Exchange account has been changed. The link is to https://openid.stackexchange.com/user so would presumably need me to be logged in there (which I wasn't) to do anything about it. P.S. This is related to but not duplicate of Logins can be added/removed without reauthenticating, allowing temporary XSS to be escalated to permanent account hijacking, with both bugs stemming from lack of defense-in-depth here. Thanks for bringing this up. You're absolutely right that this is a security issue, but it's been this way forever without a lot of reported problems (that's not a rationalization, I just mean to show that it isn't super pressing). The problem is only truly exploitable if we open up an XSS vulnerability on our site, or you leave yourself logged in on a public computer. In the future, we're going to try and enhance major account changing actions with re-authorization requirements, but it's very complex as we support multiple means of registration and login. tl;dr - it's on our list, but it's not the next thing we're going to take on. Not the answer you're looking for? Browse other questions tagged bug status-completed security stack-exchange-openid . Has any [status-deferred] issue ever been completed? Where should I ask a “question” about password security? Why doesn't SE default to https for the change password page?